The Nike Basketball division has had an interesting year to say the least. From a performance standpoint, it’s been awhile since I have reviewed a Nike product that I truly loved playing in. The shoes I’ve recently tested from the brand have all had a pretty significant flaw in my eyes. In the Kobe IX for example, there’s a total lack of midfoot support/cushioning and for me, it made the shoe unwearable after a few games. The LeBron XI never quite fit or flexed naturally for me. Neither of the KD models fit me well and the Elite version had a serious fit/stability issue. Even from other brands, I struggled to really find a shoe I liked playing in outside of adidas’ Rose 4.5. With all these reviews in the rearview mirror, I was anticipating a fresh start in the KD7. There is plenty of tech to be found, including a 180° Zoom bag, Hyperposite heel/collar, midfoot strap, and Dynamic Flywire support. Thankfully, the shoe delivers and is one of the top performers I’ve hooped in this year. The KD7 features a hybrid construction, with a mesh forefoot forefoot and midfoot construction combined with a Hyperposite heel. I had some initial doubts before as to how well the two very different materials would blend, but I found the fit to be very good. I hope this mesh construction is something Nike uses more of going forward, because it plays so much more naturally than Fuse does. The flexibility it allows is awesome, and using mesh allows lets the Flywire cables – which are actually utilized – to cinch the foot down. Whereas a thicker, stiffer Fuse setup limits the amount of support you get from Flywire, this mesh build helps the cables pull as tight as possible. There’s ample room in the toebox, and even though an 11 is typically a little short for me, there’s just enough volume in the toebox that it fits perfectly without constricting the toes. The mesh build helps here again, giving you plenty of flexibility in a key area. Forefoot lockdown is very good – you can lace the KD7 up extremely tight – and the midfoot strap is actually useful for midfoot lockdown. You might notice some pressure on the top of your foot due to the strap and the stitching of Hyperposite piece, but that’s mostly alleviated after the first few wearings. I noticed very slight slippage in the heel fit upon the first few wearings, but I’d chalk that up to the Hyperposite getting broken in. It’s a stiffer material, but it holds its shape and will mold to your foot somewhat after you get them broken in. Overall, the fit was excellent in the KD7, particularly in the forefoot area. It’s the first and most important box to check, and the Swoosh nailed it with this one. The KD7 is very smooth from heel strike to toe off, with a full length Zoom unit, stable midsole and flexible outsole. I almost felt like the shoe promoted more of a midfoot strike – not to the extent of the KD III, which felt like it had a bulge under your arch that rolled you forward – but I noticed myself not landing quite as squarely on my heel. A midfoot strike is a very neutral and natural gait (it’s what many competitive runners strive for), so this is a good thing. 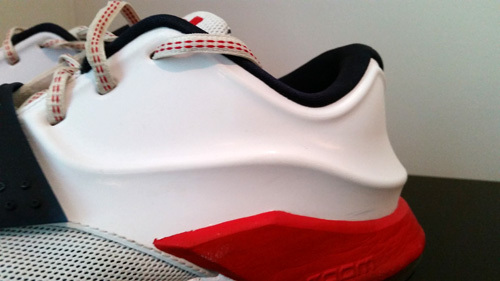 As mentioned before, the shoe features a 180° Zoom bag, visible at the heel. The Zoom bag is housed in a solid midsole that provides plenty of support while still remaining flexible. The midfoot support from the KD7 is the best I’ve had since the Anatomix last year. While I may sound old harping on support, if you play enough ball you WILL need it eventually. You’ll notice five TPU bars on the bottom of the shoe that run through the midfoot, mimicking the bones of your foot. This aids support while promoting natural flexibility, and is a fantastic addition to the cushioning setup. 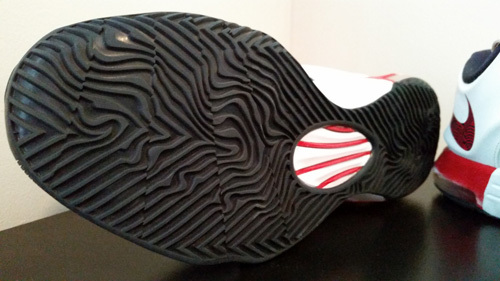 The UA Anatomix Spawn featured a TPU support structure with a similar idea in mind, and it was great in that shoe too. Hopefully, the extreme lightweight/flexible movement will get phased out of basketball models and we’ll get more attention to detail when it comes to midfoot support. Responsiveness is excellent with a firm but bouncy Zoom setup. Stability is also very good, thanks to the supportive midsole and overall fit of the upper. The lateral stability is miles ahead of the KD VI Elite. As far as step in comfort, you’ll be hard pressed to find a better hoops shoe. The Jordan CP3.VII and XX8 SE both were extremely comfortable underfoot, and the KD7 is right there in terms of sheer comfort. Overall, this may be my favorite cushioning setup of the year across all categories along with the XX8 SE. I loved the support and responsiveness especially, and it simply plays well in every aspect. Featuring a pressure mapped outsole with a herringbone-esque pattern (more wavy, reminded me a little of the Jordan XX3 models), the traction is excellent. Flexibility is good and the channels are deep, which is a recipe for reliable traction underfoot. I’ve only used it indoors, a few times on very good floors and once on a dustier one, but traction was great no matter what. No issues so far here. The Hyperposite heel will scuff some on the medial side, but that’s to be expected. I anticipate the mesh holding up well in the forefoot, given that it’s backed by another layer of fabric. There’s also a medial toecap for durability in the toebox. I was concerned at first about the Hyperposite being stitched directly to the mesh but its well constructed and after playing in it I don’t have any concerns there. The KD7 proved to be one of the best shoes I’ve tested this year. It instantly becomes a go-to shoe for me thanks to the lockdown, support and responsiveness, along with great transition and traction. It’s simply a very good shoe overall, built to be a performance beast rather than just a unique silhouette like the KD 6. I was beginning to doubt Nike after being disappointed in the last few models I’d tested, but they got this one right. As a final note, I think this is a great shoe for any position. There’s enough support for bigger guys, but the shoe plays very light and nimble thanks to the secure fit and good responsiveness. If you’re looking for a team shoe or something to last all season, definitely make it a priority to try on the KD7. Good stuff Jake — really enjoying this model myself. Thanks man. I’m not that old, but I have a decent amount of miles on me thanks to high school ball/college ball/various men’s leagues, and it’s tough to find a shoe that I can play in for two hours and be comfortable the whole time. KD7s are that shoe though. Just really good all around. Kd 7 vs Drose 4.5 ? Depends on your preferences. I may do a comparison review later, but I will lean towards the KD7 because of softer cusioning and a more comfortable shoe overall. Rose 4.5 has slightly better heel fit, KD7 is more responsive. Other than that, just have to try em on and see what you like. Good Review. was waiting for your kd7 review. looks good, i might have to pick a pair up. They’re an awesome all around shoe. I’m in the ClutchFits right now and they’re solid, but still partial to the KD7. Great review. Just one thing, how does the kd 7 compared to the cp3 7s? which one are more responsive? I personally thought the KD7 was slightly better, probably because it seemed like a smoother transition from heel to toe. 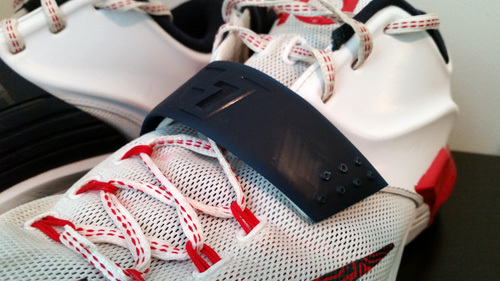 CP3.VI’s cushioning setup was really good too, but KD7s felt smoother and thus more responsive the whole way. Both are well above average though. I never had any issues with the traction, but it could be that the floor was just a little dusty or that your pair needed a little break-in period. Sometimes brand new pairs almost have a little sheen on the outsole that needs to be worn in. On any floor I played on, the traction was excellent so hopefully it improves for you. 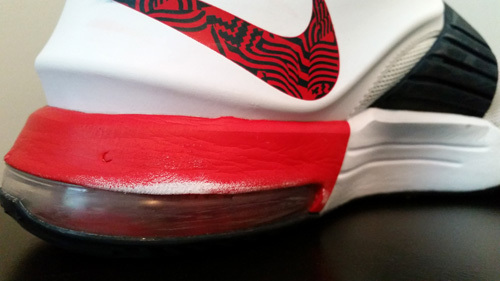 I did not like the KD V Elite either – that shoe was really stiff, and the cushioning was firm and not responsive. I rarely buy shoes and I’ve been struggling to make a decision for a while, which shoe is better performance wise out of the kobe 9 em low and the kd 7? Depends on what you like in a shoe, but I would go with the KD7. It is more supportive with a better midsole and Zoom cushioning. I felt like the Kobe 9 was too flexible, to the point where it just wasn’t enough support underneath, and the drop in Lunar insert didn’t provide me enough cushioning overall. The fit on the 9 is probably a little tighter because the Engineered Mesh fits a little closer to the foot, and some people found a little heel slip with the KD7 – I thought it was just fine though, and the lockdown is great from the midfoot down. Both shoes’ traction is very good although the Kobe 9 is insanely good. Just think the KD7 is the better overall shoe. I appreciate the work you guys do. You guys must be the one of the best, most slept on performance review sites around. Hope you stay underground. I’m a aggressive slasher and I’m debating between the drose 5 and kd 7. I highly value traction, support/ fit, and a cushioning. I have plantar fasciitis and replace stock insoles with a arch supported insole. My favorite performance models of all time are the kobe 6s, jordan xx8, and lebron 8. Thoughts? I appreciate that man – stuff like that keeps us goin. In my opinion, the KD7 would be the better option because it’s got a firmer midsole and thicker cushioning combo than the Rose 5. It also has little TPU fingers running though the sole too. The torsional support piece in the Rose 5 is decent and works well in that midsole, but Boost is a really soft foam compound and it’s not enough to provide support like you will probably need. The Rose 5 insole is super thin though, so your extra insole might fit well in it. Still from a stock shoe standpoint, the KD7 is gonna be better in terms of support – and the rest of the shoe plays really well too. Thanks for your response and the advice! How would you describe your playing style and can I ask your height and weight? 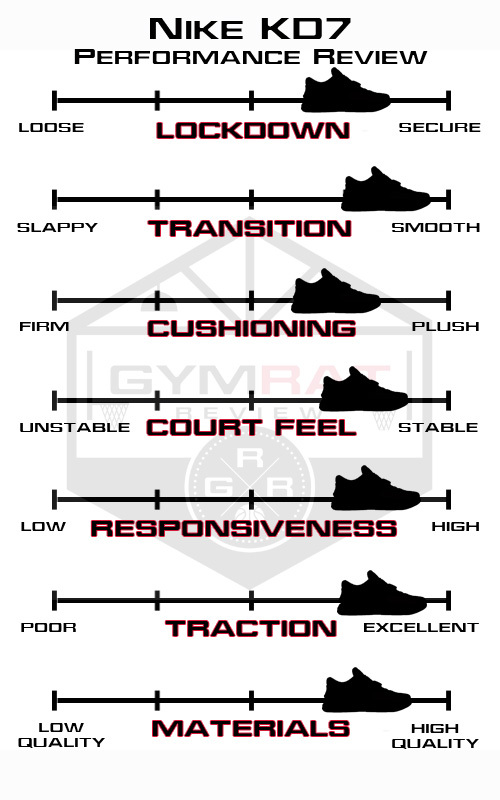 And lastly, out of the XX9, DRose 5, and KD 7, which one had the best traction, and how would you rank each against each other in terms of performance? I’m 5’9″ 165 and played point at the small college level, so my game pretty much consists of being shifty, quick, with some pull ups. I need a shoe that fits really snug and plays low to the ground and responsive (this will explain my ranking of those shoes in a sec). I also had a couple of serious injuries that I’ve recovered from, so support is important for me too – though probably not as much as someone with plantar fasciitis. Traction is basically splitting hairs, they’re all good. I would go KD7 – XX9 – D Rose 5 in that order for traction though. Personally, I’d go 1) Rose 5 1a) KD7 3) XX9 for overall performance. Again that comes down to your playing style, and I could see anyone liking any of those 3. But I still play in the Rose 5 and KDs, the XX9 I sent back to Nike when a lace loop tore out. Going to get myself a new hoops shoe this weekend. Really considering your opinion as far as hoop shoes go (KD 7 & DRose 5). Weartesters and Kickgenius have given the D Rose 5 a sub par review, but I can’t always trust their opinion. Plus their playing style may be different than mine. I guess what it comes down to now is cushioning and beastly traction. I know you put the kd 7 and xx9 ahead of the drose 5 in traction, but put the drose 5 ahead of the kd 7 and xx9 overall. Just wondering if anything has changed since then. Thanks again for your help and the great work! I liked both shoes quite a bit. The KD7 will have a thicker midsole, very smooth transition and good traction, plus two solid Zoom units. I thought it was very well cushioned all around – stable, responsive and soft with good court feel. The Rose 5 also is a soft, responsive cushioning setup, but it is thinner and lower to the ground, especially in the forefoot. I loved the frame and fit of the Rose 5 though, lockdown was insanely good thanks to the Fitcage that runs the full length of the upper and kind of stabilizes the collar around the ankle. Both shoes should satisfy your need for good traction. I know some people didn’t like the Rose 5 upper in the red Brenda colorway (which is what I tested) and it did crease real easily. But I still got amazing lockdown out of it and the creasing didn’t affect the performance for me. I thought there was a tiny bit of heel slip in the KD7, but there’s not much bad I can say about either shoe. Your decision will probably depend on if you want a slightly thicker midsole and better midfoot support of the KD7, or if you really value court feel and the low profile, bouncy setup of Boost in the Rose 5. You’ll be happy with the traction on either one. Hey JT what are you thinking in regards to the kd7 vs hyperrev 2015 so far. I was thinking about picking up either pair today. I prefer low tops and the hyperrev seems to look pretty low to me as well and should probably be classified as one. I loved the KD7, but I think I like the HyperRev even better. For my playing style as a PG, they’re pretty perfect. Forefoot fit could be better but lockdown is much better than last year. Nice and responsive, flexible too. KD7 is definitely sturdier with a thicker midsole, and is good at pretty much every area, but the HyperRev hits a sweet spot for me. Thanks for the comparison. Was looking at both as well. Hyperrev 2015 or Rose 5? I’ve heard nothing but great things about the hyperev. Heard it’s comparable to the Kobe 6. Can you compare the traction between the two? Very good review, thanks. I did find the stitching of the Hyperposite piece to be a problem on my right foot (only tried on in store) so I went for the HyperRev 2015, even though for my play the KD 7 would have been more suitable. Looking forward to your review of the HyperRev; am impressed with it so far, btw. Yeah I’d read of some people having an issue with the mesh – Posite transition, just never cropped up for me. My HyperRev review is about done, and I too liked it a lot. I picked up a pair of the HR 2015 off of nike.com, The orange/royal blue ones. They look fantastic, i think in terms of looks they are my all time favorite shoe, love how the bright colors pop. Played in them last night for over 3 hours and a ton of games and they performed awesome. No pain or soreness anywhere and good traction even on the slightly dusty court i was on. constantly got the reassuring squeak. Forget you have them on, an awesome shoe. Yup, feel the same way on court. Very natural feeling and heel fit is sooooo much better than the 2014s. I ended up with a pretty painful bruised heel in them, but that’s pry the result of playing in 3-4 leagues per week over the last few months more than anything. Should be knocking out the review soon. the looks of shoes that ive owned. to clear that up. The material used on the front part of the shoe ripped a bit after I’ve only had them for a month. Any suggestions as to what I should do? visible air bags always mean they sit higher off the ground for me, with the only exception being the air zoom drive, which i loved to death. Wore 2 pairs to the ground. How do these feel? clunky/high off the ground? Can i also know if you experienced any heel slip? thanks!! I also was a huge fan of the Zoom Drive and I check eBay religiously for a pair in my size. That shoe was seriously underrated. 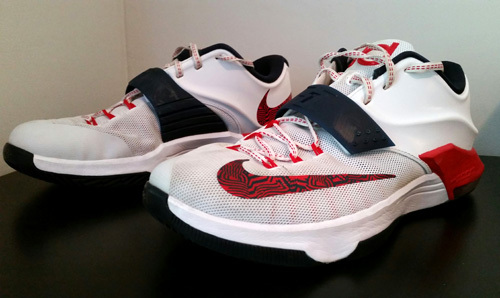 As for the KD7, they weren’t clunky at all and the court feel/stability was excellent. I didn’t feel like they played any higher than most other shoes – the midsole is definitely more fully cushioned than others but to me it did not lead to a clunky feel. I know a lot of people felt some heel slip in the KD7 and I did notice it a little bit too. But laced tightly, it was never enough to cause me any concern. As I mentioned in the review, once I got a few wearings in and the Posite heel got broken in, I noticed even less slippage. I’d have liked some achilles notches on the interior and I think that would have fixed that issue. Traction is very good, better than the Spawns for sure. thanks for the response! gonna look for a pair now! i also hope the traction works as well as mentioned… got the anatomix spawns cos of the purportedly insane traction on most other review sites, but they just dont work for me, on any indoor court. now they are sitting in their box looking pretty. you reckon cutting off the strap will make them less unstable? Ooops! I meant *less stable hahahahah. But I’m glad u answered the intended qn anw haha. Thanks! Not shutting down, but just can’t crank em out like I used to – it’s an expensive hobby without a connect in the industry. The reviewers that get the connects have worked at it for awhile, just don’t know if I’ll invest the money into it. I still hoop all the time and therefore I still get shoes every couple of months. My Crazylight Boost Primeknit review is goin up tonight and I did just pick up the Brandblack Blackhawk on Finishline clearance – so that review is underway too. Glad you liked the reviews though, I have a blast doing em. Kd 7 or Kd 8? I love your reviews, im just wondering which shoe do you prefer in terms of bouncyness kd7 or hyperrev 2015 or any shoe that gives a lil extra bounce? im 5’5 125lbs can grab rim im trying to find a shoe that will help me a little with bounce, any reccomendations? thanks! I am jealous of your bounce haha. But I would probably lean towards the HyperRev 2015 because the midsole is lighter and more flexible and really frees up your foot to work with the Zoom bags. The KD7 has a full volume Zoom bag in the heel and a substantial bag in the forefoot but it’s not quite as flexible as the HyperRev. I don’t think either shoe will make you jump any higher, but the HyperRev lets you move a little more naturally and that’s important if you’re trying to jump as high as possible. damn that was a superfast reply!! thank you i have been working on my vertical since 16 lol i used to touch the bottom net then when i was 18 thats the first time i touched the rim i just turned 19 now 🙂 and thanks so much for ur opinion i will give hyperrev2015 a go and the black and gold color looks cool too! Yeah I hooped in them quite a bit and never have any tears or runs in the mesh. No separation where it joins the Posite either. It’s got a Fuse toecap too so toe drag shouldn’t hurt it much. I could see where maybe a heavier player or a more explosive player than I may blow it out but I kind of doubt it. No prob. Of course everyone is different (they didn’t work for KD himself) but I really liked the shoe overall. Probably good sale prices now too. 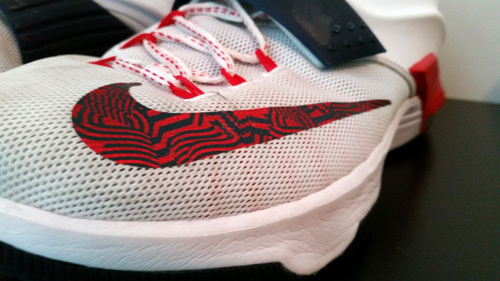 are you planning to do a performance review on a new kd model,KD 8? kd 7 or d lillard 2 for point guard?